It all started with a Psicom published book, one of the volumes of The Panti Chronicles. I purchased the only remaining copy in a National Book Store outlet nearby because I was amused by the prologue at the back cover. It was hilarious. And so I researched about Psicom online and discovered other interesting titles I’d be looking forward to read. 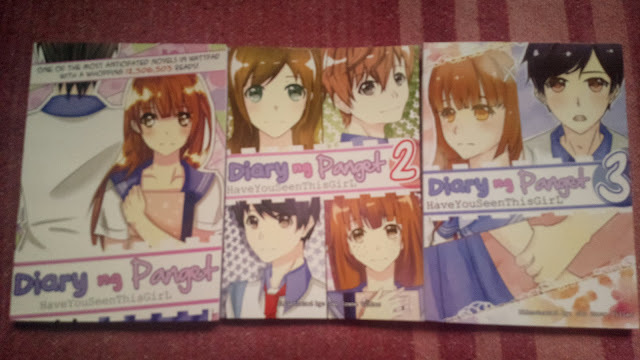 Then I stumbled upon a copy of Diary ng Panget in the same NBS branch months ago. It was book 1 and 3. I grabbed the copies simply because it was from Psicom and I assumed it will be entertaining as well. And I was right! Book 1 had me rolling all over the floor in hysterical laughter! I only recently read book 2 and 3 though because I had to scour other NBS locations for book 2. Thank goodness for MOA’s NBS! Each book would leave you wanting more because the author, haveyouseenthisgirl or Denny in real life had wittingly published her novel in 4 parts supposedly so teeners can easily purchase them every month when one book is released. By the way, although book 4 is supposedly already published by Psicom, I don’t see it distributed through NBS yet. I would rather read the condensed copy (publication version) rather than painstakingly take time reading the uncut versions in Wattpad where it was originally published in 2011. Denny wrote while studying in Italy. She speaks English, Italian, and Filipino and has not forgotten her roots. She confessed that she still writes better in Filipino than in English. Going back to the book, although the storyline is cliché, how it was narrated is epic. It’s a Cinderella story where Eya Rodriguez, the main character became a maid too but for her supposed monster prince – Cross Sandford (whom teenybopper fans do call “Prince” indeed), except that she is no lovely maiden in the cinders. She was described as “panget” but it appears that she just needed help from apparent fairy godmothers - Lorraine “Lory” Keet (her Brit slang best friend) and Ian, Cross’ best friend. Even the Sandford patriarch (Cross’ dad) seems to be supporting the two’s developing love story. And so being together often, despite arguing all the time, Cross developed romantic feelings for Eya and I think she did too although she didn’t realize it immediately because she was infatuated with her other bestfriend Chad Jimenez (who is in love with Lory). Each chapter, though slow but sure, made Cross and Eya closer together, although there were numerous parts intended for a potential Eya and Chad affair instead. Literally, its Diary ng Panget because of Eya’s diary but it can well be titled Rocketeer because this Far East Movement song can basically become the story’s theme. Even the Cross-Eya love team started and developed through this track. This story is phenomenal that an upcoming movie is soon to be produced by Viva Films set for 2014. I’m no fan of the Kathryn Bernardo love team but I was rooting for them as Cross and Eya while Julia Montes and Enrique Gil would have been ideal for Lory and Chad’s character.